Last week the Le Monde graphic on job losses featured here. 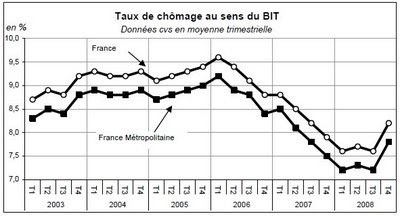 This is a brief contextual follow-up using data from INSEE (Institut National de la Statistique et des Études Économiques). Including overseas territories the rate sits at 8.2% - or about 2.3 million people. A sharp reveral of the prior trend but far from enough to erase job gains since 2006. Yet the social reaction has been in some cases energetically violent - and this is France with her extensive labour protections. "Angry French tyre factory workers burst into a management meeting Monday and pelted their bosses with eggs to protest the closure of their plant. Hundreds of workers from the German firm Continental had traveled by bus from their plant in the northern town of Clairoix to protest outside a hotel in the nearby city of Reims where the meeting was being held." Quite an effort by the unions and a worrying sign, perhaps, of thing to come. NB: Photo credit Reuters. This a crop from a full image to be found here.